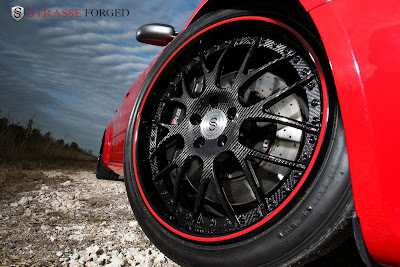 In our opinion, Strasse Forged creates some of the most appealing wheels on the market today. It's only fitting then that their latest show car carries a four-ringed emblem. 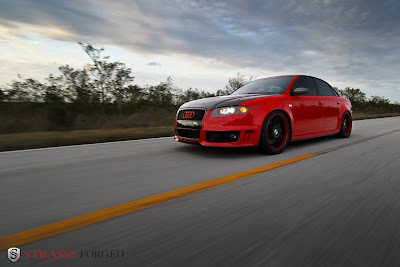 Strasse's Audi RS4 not only features Strasse Forged SM8 design, 3-piece wheels but includes a list of goodies any quattroholic would die for. First off, we'll delve into the focal point of this showcar - the Strasse Forged SM8 design, 19" 3-piece wheels with carbon fiber centers. You may notice that one side of the vehicle has wheels with black lips with a color matched Misano red pinstripe and the other side features color matched Misano red lips with a black pinstripe. This was done to show the two optional color schemes while still being displayed on the same car. The wheels also feature race prep, which are hollow chambers on the back pad of each wheel for the sole purpose of weight reduction. Reduction in weight can be several pounds depending on the vehicle. 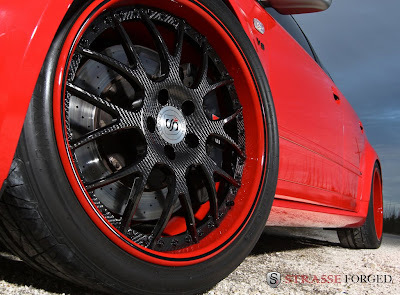 Wheels are made of T6-6061 forged aircraft aluminum and sit on Nitto Invo tires. Dressing up the exterior, you'll find a Vorsteiner carbon fiber hood with painted slits, Oettinger roof spoiler, dual nitrous purge out of bumper vents, smoked tail lights and side markers, a black headlamp housing and painted emblems (red Audi rings, all other emblems black). 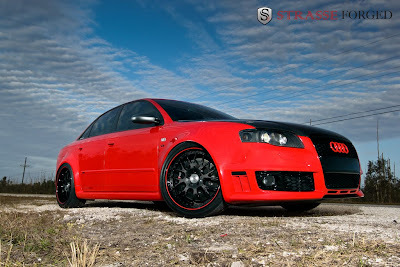 Finally, it's worth noting that this Audi RS4 show car is not just "all show and no go." Under the hood you'll find a Stage II Revo software upgrade, custom 3" piping from headers back with Magnaflow mufflers and ceramic coated black tips, K&N air filter, short shifter and even an active shot of nitrous.